About:Memoria Press presented me with the Book of Astronomy Set to review. This comes with the student guide as well as the teacher guide. The student guide is intended for one student but you can purchase additional student books for $14.95. It is recommended for grades 3 to 5 but I think older could use it as well and still learn from it. The book goes over constellations, names of stars, motion of the earth, the seasons, and the zodiacs. How we used: The book is broken down into four units. Each of those units are then broken down into lessons with in that unit. Each one focuses on a star, planet or constellation or like. When the lesson is presented it is then followed by an activity. These are things like drawings, questions, charts, or discussions. At the end of the completed unit there is then a complete review over the unit. The student book also contains an appendix that contains extra activity sheets. The teacher books contains all the lessons as well as the answers to the activities. There are also unit tests and a complete final test for the whole book. We really enjoyed the lessons. They were short and to the point. This kept the daugher interested and there was not to much information thrown in at once ro confuse her. He do not own an overhead so when that was mentioned to use we just had to look at the sheet. The lessons were all fun and went nicely with the lesson. She really enjoyed drawing the constellations. This prompted her to try to find them of a night. I really love that it perked her intrest in something outside of "school time" and made her want to learn more and want to ask more questions. Our discussions at the end of lessons I think lasted much longer than the lessons did. We worked on the lessons daily. She was ready for more every day and to make sure she remembered everything we learned the day before. We didn't do the test because tests make her anxious and nervous but I don't think excluding them from the units took away from the work. I think it would work great for other kids that need that accountability though. It would also work well if you need those types of things to show in portfolios or end of the year evaluations in your homeschool. 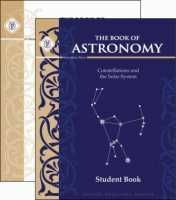 Memoria Press is a Christian company and this book would work well for a child curious about Astronomy or for a homeschooler needing to add this into their lessons. They also offer other great topics and you can check out a few others from my crew mates by clicking the banner below. There is also other reviews on Astronomy as well. So don't just take my word for it, see what others have to say, you won't be sorry.